It suddenly got a bit colder out and I was immediatly thinking about a warm comforting soup. The first soup that I thought of was of course chicken noodle soup and then I remembered seeing this recipe for a Thai chicken noodle soup which sounded really good. I could just imagine all of the fresh and bright Thai flavours in a chicken noodle soup and I just had to make it. 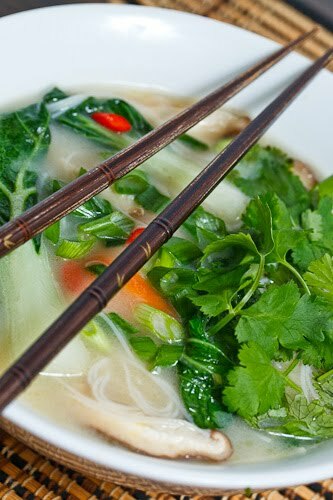 This soup starts out with your basics like the chicken broth, the chicken and the noodles, though this soup uses rice noodles, and from there it goes on to add some Thai flavours including lemongrass, lime, garlic, ginger, fish sauce and something special, a hit of coconut milk to make the broth nice and smooth. You could add any vegetables that you like and I went with carrots and bok choy and I finished it off with some sliced shiitake mushrooms. Despite the long list of ingredients this soup is nice and easy to make and yet it is so amazingly good! The soup was just bursting with flavour and a freshness that was very welcome on a cold winter day! One of my favourite things about Thai cuisine is the use of lots of fresh herbs and the fresh cilantro really brought this soup home. Another one of my favourite aspects of Thai cuisine is the spicy heat and the birds eye chilies certainly warmed this soup up nicely. Bring a pot of water to a boil and remove from heat. Add the noodles, cover and let sit until cooked al dente, about 5-8 minutes. Meanwhile, bring the chicken stock to a boil in a large pot. Add the chicken, carrots, lemongrass, kaffir lime leaves, chillies, garlic, galangal and simmer until cooked, about 5-8 minutes. Add the bok choy, and shiitake mushrooms and simmer until the bok choy just wilts, about 1-2 minutes. Reduce the heat and mix in the coconut milk, fish sauce, lime juice and zest, and pepper. Remove from heat and mix in the noodles, cilantro and green onions. Interesting sounding recipe! I like the vegetables that you chose. I love bok choy and mushrooms. I'm just starting a "food" blog, about my experiments with Irish cooking. Hope you'll stop by and take a look! your blog is awsome and the food looks AMAZING also I love your camera! Yet again I am drooling…you are great at the asian fusion thing! P.S. I am going to be attempting your kimchi recipe this weekend, I'll let you know how it goes (complete with pictures and linkage)! With those tiny little birds eye chilis, this soup must have had quite a kick!!! I love Thai food! This soup looks so good. Not too many ingredients. Just neat and delicious. Thai soups are always so comforting. I love your interpretation. It really looks delicious. Have a great day, Kevin. And don't forget the sriracha sauce!! Mmmm Thai flavors are by far some of the best out there. They would definitely make chicken soup much more appealing. That noodle soup looks the best I've ever seen! I'm shivering in my socks in MN – this does sound good. A sort of Pho. I love baby bok choy in all. I was thinking about making a Thai soup this weekend and this looks perfect! oh my gosh kevin we have that artic cold front now. it's awful! I'm so cold and have the heat on 70. I will print this one out. I need this for my cold bones! I can sometimes get tired of the old formulaic chicken noodle soup, so I love a good variation. I also love love love Thai flavors. Tom Ka Gai is one of my favorite soups in the world, but can be a bit heavy. This looks nice and light, but can still be a satisfying meal. I have had such a craving for this lately…and I've never tried! Must remedy that. I think I'm drawn to the comfort of chicken and noodles but with a pop of freshness from the herbs and a bit of heat from the chilis. Beautiful photo. I was really hoping for a chicken tonight. This is perfect! Thanks for the complement.. THANK YOU!! This sounds amazing and I can't wait to make it!! I'm filing this one to try when I begin eating chicken again. It looks delicious! Not a huge eggplant fan but I tried this and it is delicious!!! Food looks awesome,Your blog is great.I have Bookmarked it. Plus it appears to be Gluten free!!!! Oooh I like the sound of this one too! Thanks for sharing!